Burn, baby, burn. Why can’t I bring myself to execute the obvious, rather than waffling around admiring my latest candle acquisition? Why must I wait at least a year before I enter the world of pyromania and offer it to the Gods of Wax? Most candles these days are beautiful artistic creations and it seems respectful to appreciate them for at least a little while. Scheduled for a ceremonial burning are a spiky golden fir cone, Nefertiti and a magnificent black panther, but their presence is like candy looking good enough to eat, I savor their presence. Rarely an evening goes by without the soft, warming glow of a flame gently lighting my room, which means, eventually, their day will come. 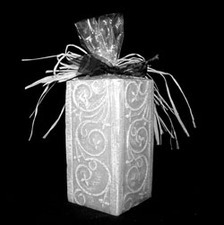 Gift-giving time is here again and everyone I know loves candles. You can buy them for people who have everything; friends, neighbors, close relatives, distant cousins who are hosting a party, office draw or even someone you don’t particularly like, but are obliged to send a gift. They are welcome gifts for all tastes, seasons and occasions and appreciated by all but perhaps the elderly and the young. They are ‘appropriate’ gifts when you aren’t close enough to the person to know their personal tastes, yet personal enough to receive a heartfelt “thank you”. Candles have been around a long time, as far back as Egyptian and Roman times, yet in those eras they were used for the sole purpose of lighting homes and temples, not decoration or mood lighting. Up until the Middle Ages, tallow was used as the principle ingredient but it provided a smoky flame and emitted an acrid odor. Beeswax candles emerged on the scene and they burned cleaner and gained popularity with the wealthier classes. Our poor Colonial ancestors spent many tedious days making candles by extracting the wax from bayberries, but it wasn’t until the growth of the whaling industry in the late 18th-century that the discovery of crystallized sperm-whale oil provided a harder product. Further developments occurred in the 19th-century with the production of paraffin wax made from oil and coal when machine-molded candles were introduced. Now that candles come in many shapes, colors, fragrances and sizes we can also find pretty glasses of gel creations holding shells, seascapes and collectibles to enhance a room’s décor or reflect a person’s hobby. Gone are the days when chunky pillars and slender tapers were only lit at a Holiday dinner party, and who remembers the horror of seeing a neglected candle melt into a pool of red or holly-scented green wax, running over the pristine white tablecloth? Safer alternatives exist in tea lights and substantial apothecary jars tucked into festive centerpieces. Not only do candles provide a pleasing visual display, they also have their practical side, especially when it comes to masking odors. On occasion, Hubby likes to cook Chicken Livers Tarragon, which is not greeted with great enthusiasm by his adult daughters, and the mere hint of cooking smells emanating from the kitchen is likely to provoke negative culinary comments. By lighting a scented candle, the fragrance of French Vanilla, Lemon Meringue, or Sage & Citrus, sniffing becomes the pleasure of aromatherapy. - Never leave a burning candle unattended! It poses a fire hazard. Always make sure you extinguish candles before going to bed. - Make sure that candles are placed in a holder on a stable, heat-resistant surface away from drafts and combustible materials. - Keep burning candles away from pets and children – accidents can happen quickly. - Trim the wick to ?” for a cleaner burn. 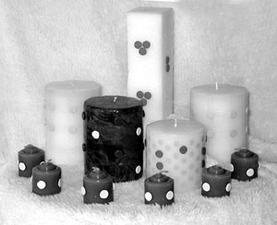 - Limit the amount of time that a candle burns to prevent uneven burning patterns or accumulating excess hot wax. - Avoid getting moisture into a candle. Trapped water can cause an explosive spattering of hot wax. - Don’t allow the flame to touch the sides of its container and overheat. Safely reposition the wick back to the center of the candle. - When relighting a candle, it isn’t necessary to straighten the wick, it should be curved to burn properly. - Blow out your candles gently to avoid splattering wax on your furniture. If you are hoarding your candles, like me, make sure that you store them away from the light in a cool, dry place to prevent them losing color and fragrance. Having said that, I must admit that I keep my works of art visible so that I can enjoy them – my panther must be at least five years old and my sister displays a cheeky little dog that has exceeded his allotted dog years. We can afford the luxury of lighting candles throughout the year, not just at Holiday times. Many lasting family traditions are marked in a rite of passage by burning a special candle to celebrate a wedding, anniversary or a child’s birthday. Enthusiastic do-it-yourselfers often make their own, starting with kits available at craft stores containing wax, wicks, oils and molds, but it seems far easier to make an emotional purchase the minute you set eyes on floating flower shapes or a multi-colored sculpted pyramid.